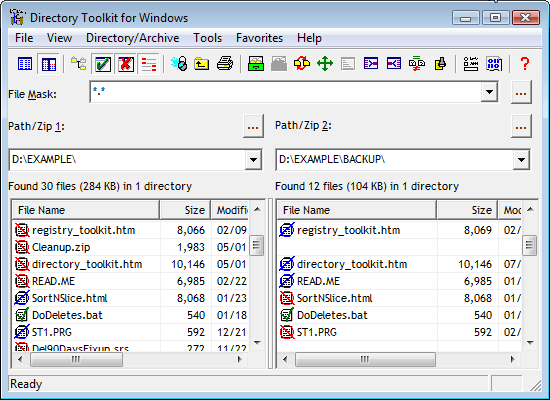 Directory Toolkit is a multipurpose directory and file utility for Windows Vista, Windows 7, Windows 8, & Windows 10. If you ever work with more than one file or more than one directory at a time, or if you use ZIP, TAR, GZ, CAB, or LZ archives, then Directory Toolkit is a must have utility. Directory Toolkit's utilities do what you simply can't do any other way. Any one of the features make it worth the price, together they make an unbeatable value! Directory Toolkit displays a single or side-by-side directory comparison using color coding for alike, different, or missing files. You can copy, move, & rename files while retaining long filenames. Built-in ZIP, TAR, GZ, LZ & CAB archive functions, with Explorer shell extensions, let you easily create & manage archives (LZ is extract-only). All of Directory Toolkit's file & directory compare functions work seamlessly on files in archives - no need for you to manually extract files first. Directory comparisons can be based on dates or a binary file analysis. Network administrators and advanced users will appreciate the command line and script operations, which let you process multiple comparison & synchronize operations within a single script file. You can also create short scripts on the fly from the program's View Menu to quickly save/retrieve the current settings. Other features include: Customizable toolbar; Windows File Explorer compatible OLE drag n Drop (including archives); Encode and Decode UUENCODED, Base64(MIME), Binhex files, quote-printable, and XXE files; Split and Concatenate files to/from diskettes; An integrated file compare viewer for a color coded display of the actual differences in files; Safe physical sort of directories; Touch files (change time/date stamp); Finds duplicate files on your hard disk; Opening files and launching applications; Wild card functions include file name numbering; Launch Replace Studio Pro or Search and Replace to search/replace files. See the Directory Toolkit Features list for details. - Great archive and general manager! - Compare directories &/or archives to find indentical, different, or missing files. - Update, freshen or remove duplicate files in two folder paths. - Rename, Copy, Move, Delete long filenames using wildcards. - Confirmations to show file replacements can be enabled or not. - Drag and Drop files between directories &/or ZIPs to/from the Explorer. - Can be used in side-by-side or a 'single directory' view. - Fast & easy to use. - Friendly to existing ZIP program associations on your system. - International Versions are available. - Mail, Fax, & Phone Orders are available. SetupDT.exe (4.5 MB) - Self-installing version for 32-bit Windows. See Install & Uninstall Information for guidance about installation and removal. Download this to a temporary directory and run 'setupdt.exe' to install. SetupDT64.exe (4.8 MB) - Self-installing version for 64-bit Windows. See Install & Uninstall Information for guidance about installation and removal. Download this to a temporary directory and run 'setupdt64.exe' to install. Purchase Now - https secure online registrations. FS ZIP Extractor - A freeware self-extractor is available. Folder Synchronize Script Editor - A freeware editor that can be used to create & edit Directory Toolkit scripts. Directory Toolkit Special Configuration Utility - a free utility that can quickly make some special settings that are not available through the program Options dialog. © 1995-2019 Funduc Software. All rights reserved. Send comments and questions about this site to webmaster@funduc.com.